This morning my new Explorer Hat from Pimoroni arrived, and the tempation to play has proved to much to resist. There are two versions of the Explorer Hat, standard and Pro. I greedily ordered one of each; the standard version is great for experimenting, but the Pro version offers several extra useful features. I started with the Pro. The Readme on the github site tells you how prepare your Pi, and then walks you though some fun experiments. I recommend that you don't install pip that way. The version of pip that's included in the raspbian distribution is quite old, and it will bring python2.6 in with it! With yet another version of Python on your pi, the possibilities for confusion are considerable, and using the outdated version of pip can cause other problems. Apart from that, the installation instructions are fine, and very clear. Once you've configured i2c and installed all the required software, you can start to flash LEDs and write code that responds to button presses. 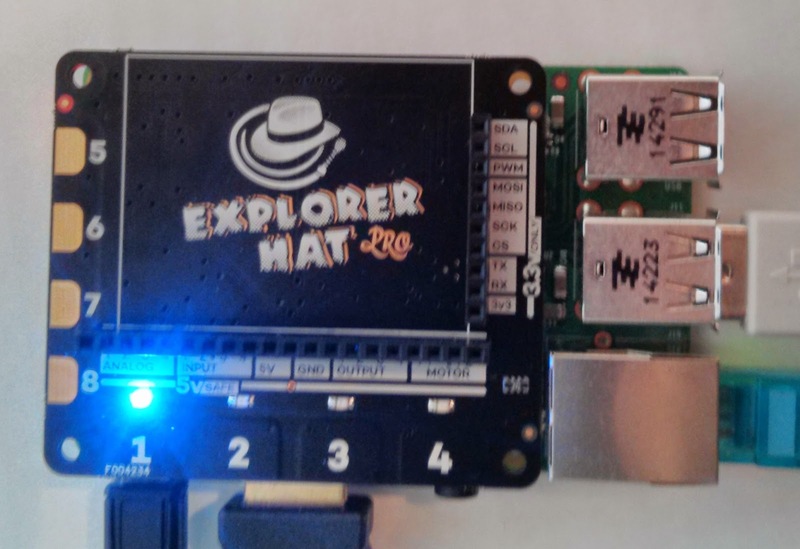 I suspect you'll find that the Explorer Hat makes it as easy to do Physical Computing on the Pi as it is on the Arduino. You'll be programming interactively in Python instead of editing, compiling and uploading code in the Arduino's c-based Wiring language. Many people will find that development is faster and the learning curve is less steep. I think Pimoroni have a real winner here, especially at the very attractive price. The Pro is £18, and the standard Explorer Hat is just £10. Spread the good news! You can share this post using the buttons below.